Vegas Pub Crawler is offering a special deal for our Five Year Anniversary Celebration! And we want to thank YOU for making it an unforgettable 5 years! This offer is only available for a limited time from June 5 through June 19. Book a Private Pub Crawl tour for just $149.99! Reserve your spot on the Pub Crawler for up to 15 people at this special rate. Got a big party? We can handle groups up to 30. Choose the number of people in your party (at least 4 people). For a private Pub Crawl, the base price for 4 people is $50. You can add up to 11 more people for just under $10 each! Buy Now, Plan, and Drink Later! Celebrate our 5 Year Anniversary all year long! Your purchase today can be used anytime in 2017! 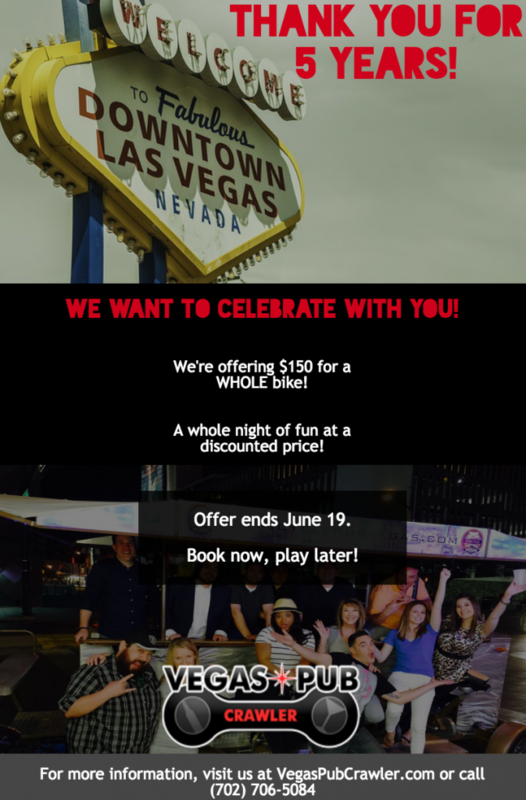 Forward your confirmation email to ridewithus@vegaspubcrawler.com with your desired date and time to schedule your tour for any time in 2017.